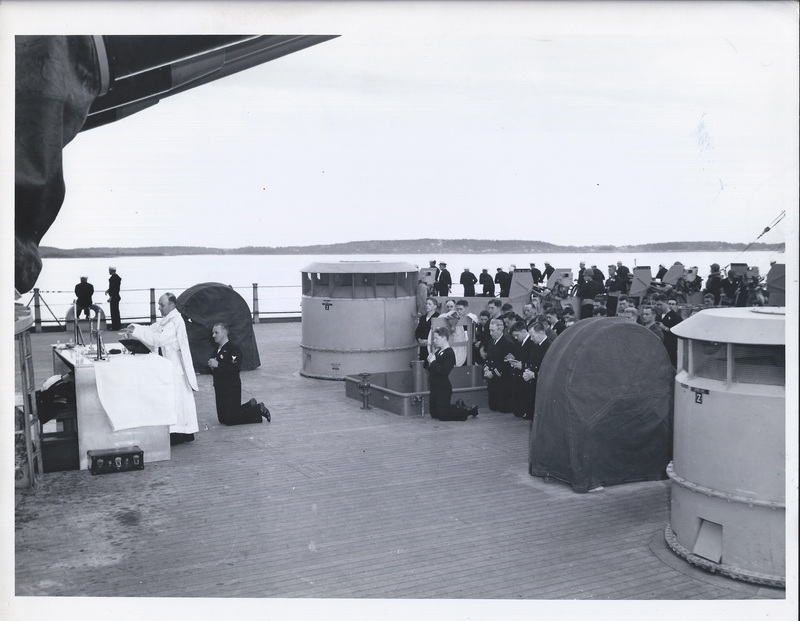 1940s, chaplain leads worship on the deck of ship in the shadow of the guns. 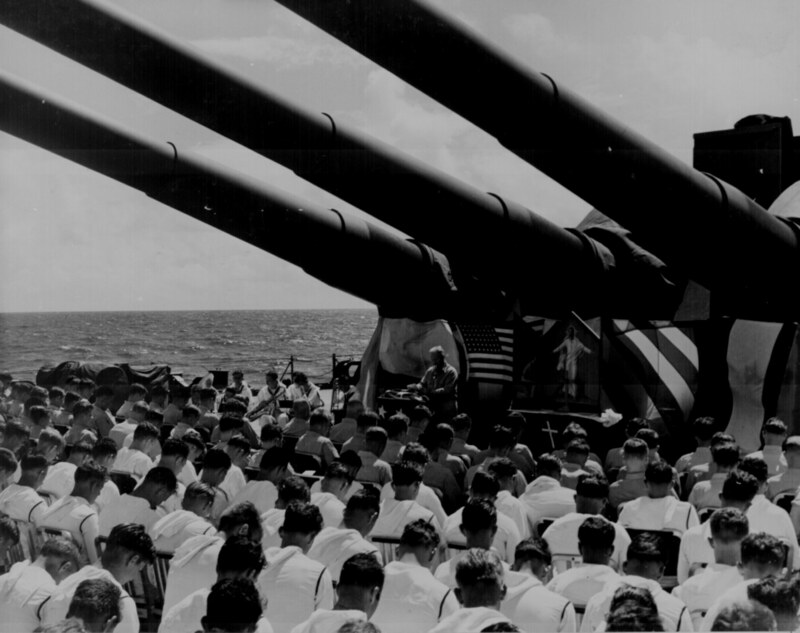 “WORSHIP ABOARD WARSHIP–Officers and men of the battleship IOWA kneel as a Catholic chaplain says Mass on the deck of the sea giant. The rites were celebrated on the shakedown cruise. Official U.S. Navy Photograph” (author’s collection). 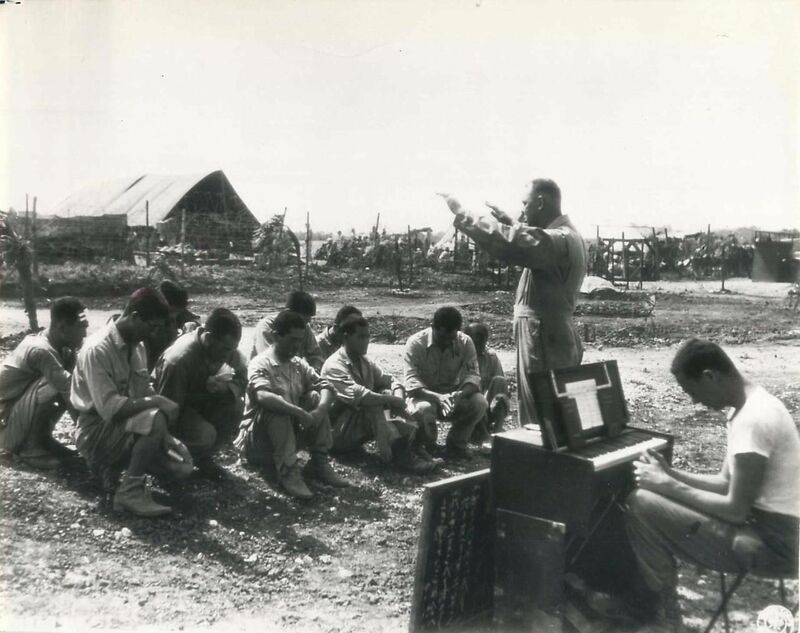 On the small island of Ie Shima (near Okinawa) in the Ryukyu archipelago an American Army chaplain leads a service over the graves of fallen Americans who had died while fighting the Japanese. 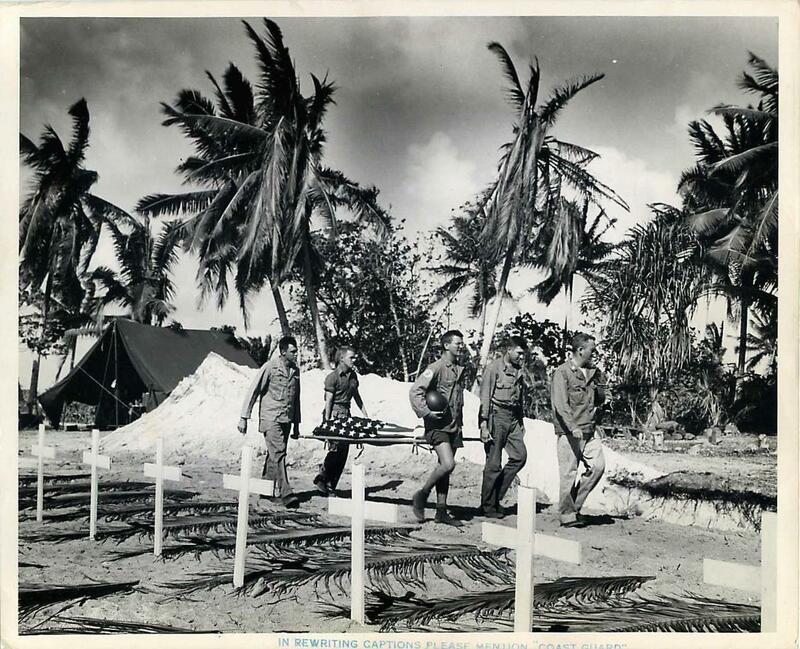 “Palm shrouded rough wooden crosses mark the graves of U.S. Marines who died in jungle fighting on New Georgia Island in the South Pacific as Chaplain Paul J. Redmond (at star-draped pulpit) conducts burial services while the dead fighters’ buddies stand by…10/16/43 USMC 11:14 a” (author’s collection). 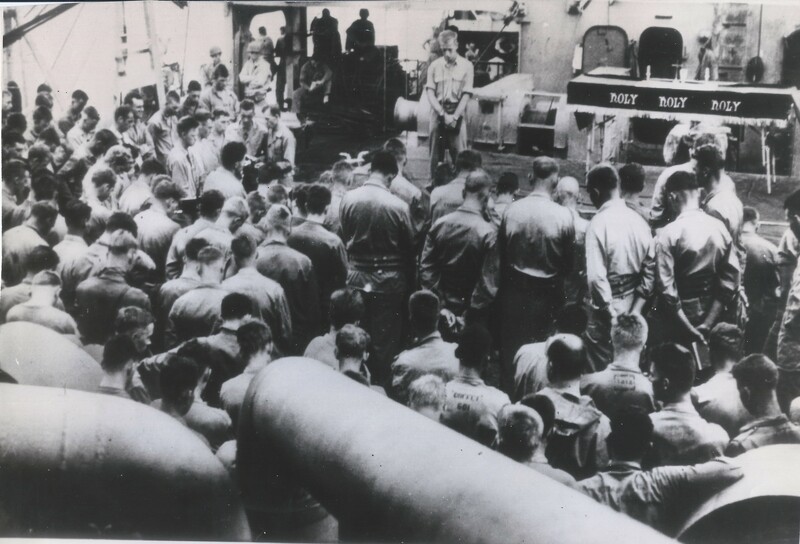 “(NY14-Feb. 25) PRE-INVASION PRAYERS—Marine combat troops bound for the invasion of Iwo Jima bow their heads in prayer during a service conducted by Navy Chaplain Herbert L. Van Meter on the open deck of a transport. Van Meter is the son of Wm. and Mrs. Thomas E. Van Meter of Moline, Ill. His wife is Mrs. Josephine Van Meter of Greenfield, Mass. 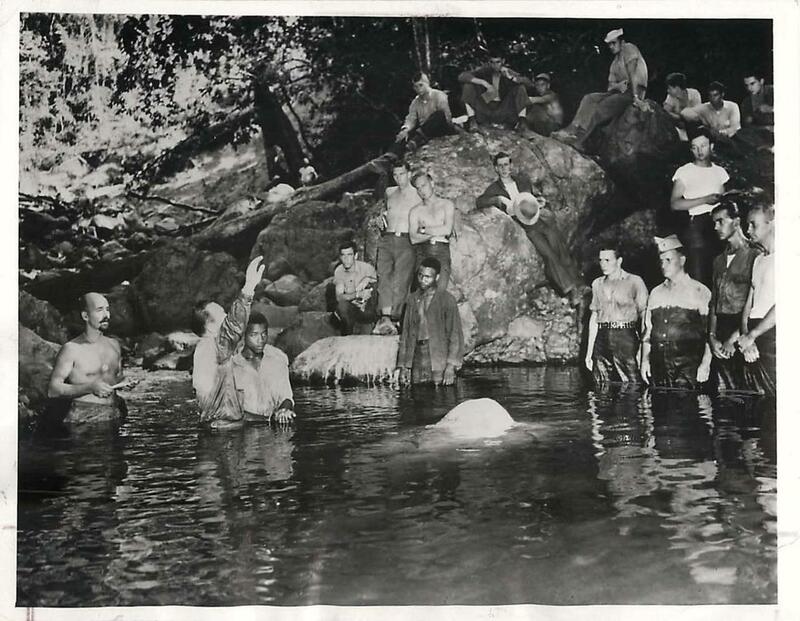 (AP Wire Photo from Marine Corps)(OB 12115USMC) 45” (author’s collection). The Battle of Mindanao (10 Mar-15 Aug 1945). This painting by Jackson Walker depicts Chaplain (CPT) Thomas A. Colgan braving Japanese gunfire to come to the aid wounded medic Robert Lee Evans. Evans and Colgan were both killed. The battle area from Talomo to Maramag was later renamed Colgan Woods by the troops in remembrance of Chaplain Colgan’s bravery. 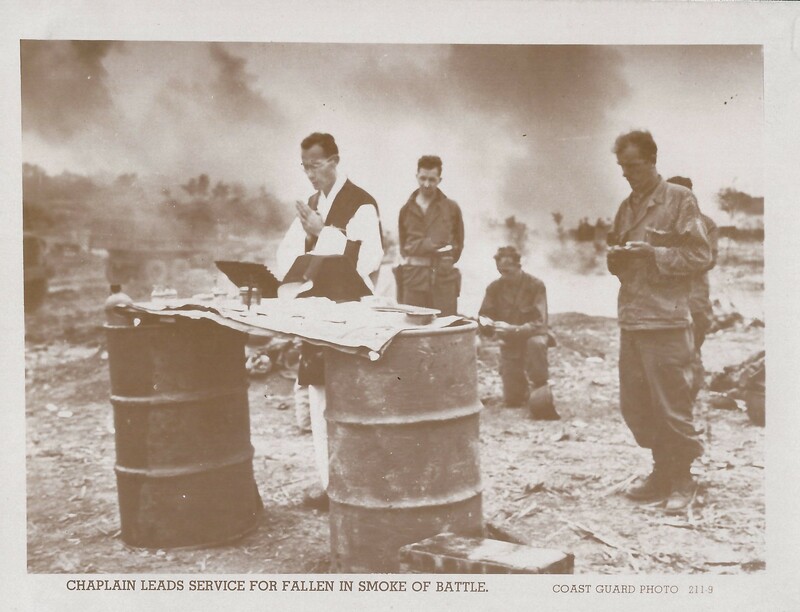 “Chaplain leads service for fallen in smoke of battle.” Coast Guard photo of chaplain providing service for Marines killed on Okinawa, 1945 (author’s collection). Japan, 1945. US Army Chaplain John A. Wilson of St Charles Seminary, Carthagaen, Ohio, who was captured on Bataan on 9 April 1942, blesses the flag made from supply parachutes by Allied prisoners of war (POWs) of war at the Maibara POW Camp in the Osaka area. After the blessing Father Wilson said mass for the POWs who participated in the ceremonies. 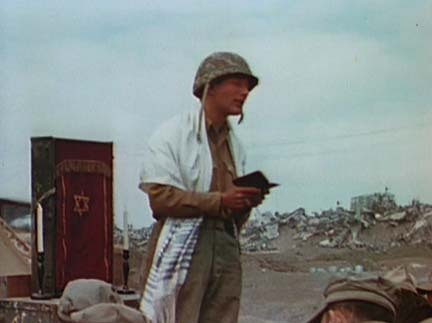 Navy chaplain Lt. Roland Gittelsohn was the first Jewish chaplain to serve in the Marine Corps and deployed with the 5th Marine Division during the Battle of Iwo Jima. 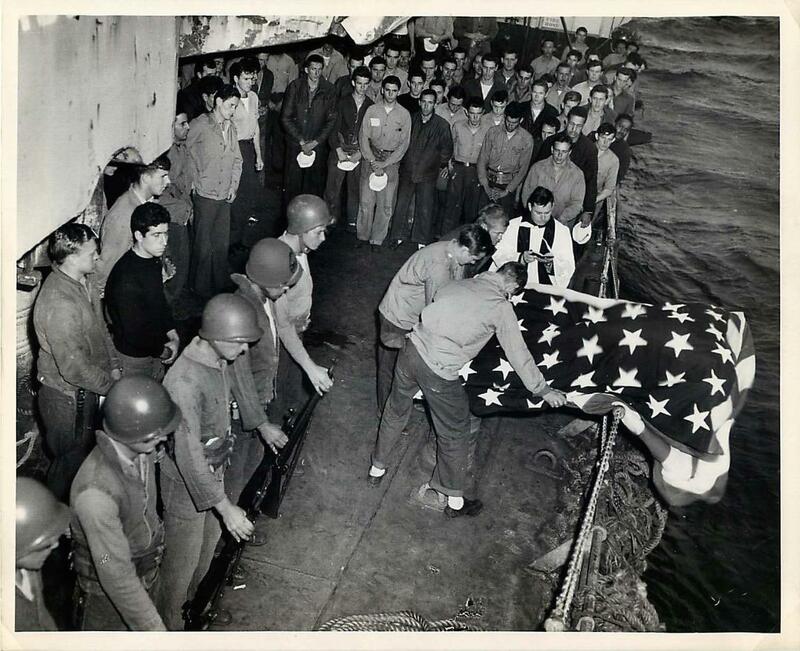 “AMERICAN FLAG COVERS SOUTH SEA NATIVE FOR BURIAL RITES. 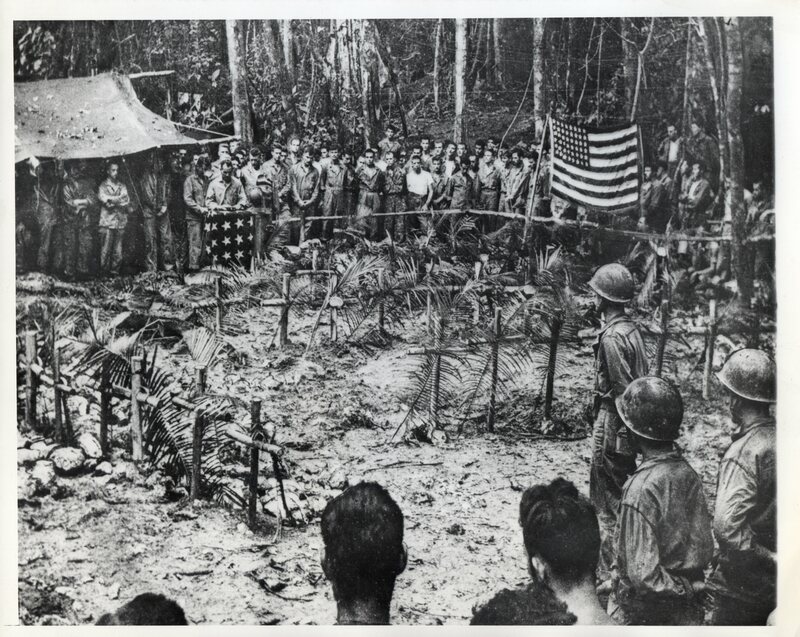 Funeral services for a Marshall Island native killed during the invasion battle are conducted by Army Chaplain William S. Gardner of Richmond, Virginia. With Coast Guardsmen and troops in the throng of mourners, the native was covered with an American Flag and carried to a burial plot near the cemetery where American fighting men, killed in the attack, lie beneath the palms. 7 Mar 44. “EASTER SERVICES CLOSE BY CORAL SEA NEW GUINEA–A beach fronting the Coral Sea serves as a church for this Easter sunrise service somewhere in New Guinea. Capt. A.B. 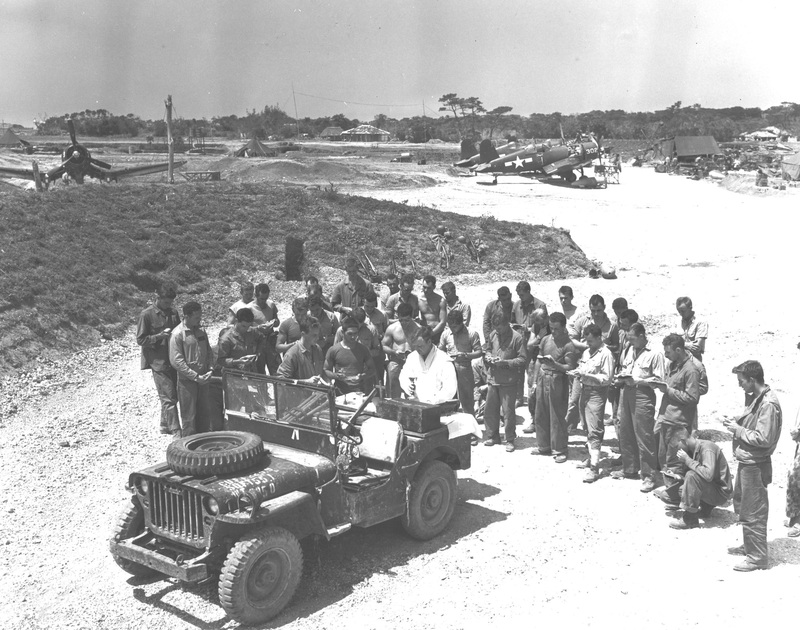 Po*sgrove, U.S. Army Chaplain, is shown delivering his sermon to part of the crowd of 600 men and women who attended. Note the wiring in the foreground which was part of the public address system used to carry the sermon to the entire gathering” 9 April 1944 (author’s collection). 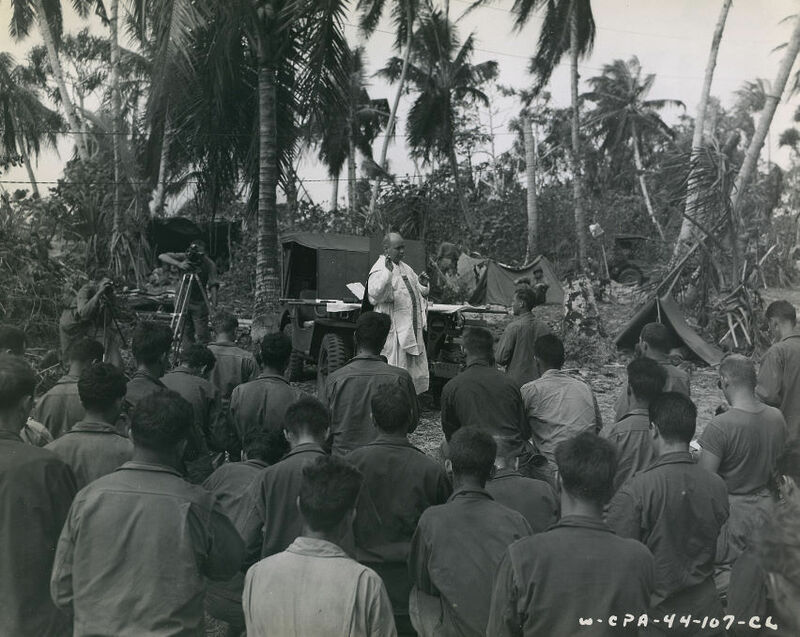 “Chaplain Bridenstein conducting Sunday Mass on Enubuj Island as U.S. Navy photographer l/c Verne Reynolds and U.S. Army photographer Sgt. Charles Van Bergen record the event on their motion picture cameras. US Army Signal Corps Photo” ca 1944. 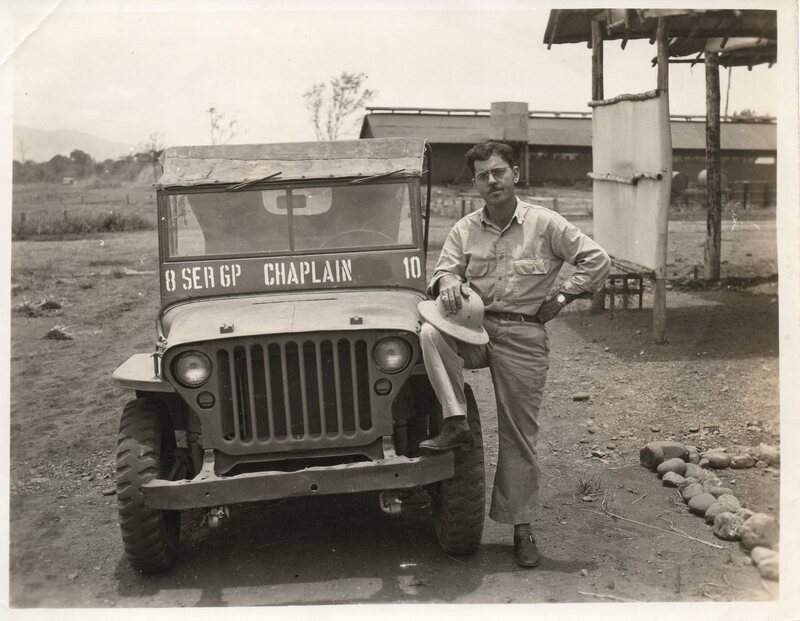 Un-named chaplain of the 8th Service Group in New Guinea with his Jeep (author’s collection). 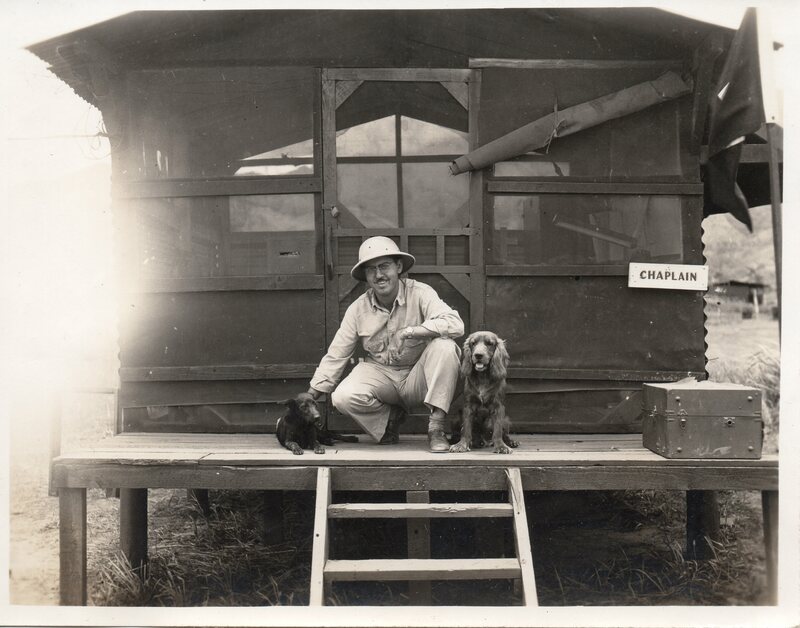 Un-named chaplain of the 8th Service Group in New Guinea in front of a very rustic chapel (author’s collection). 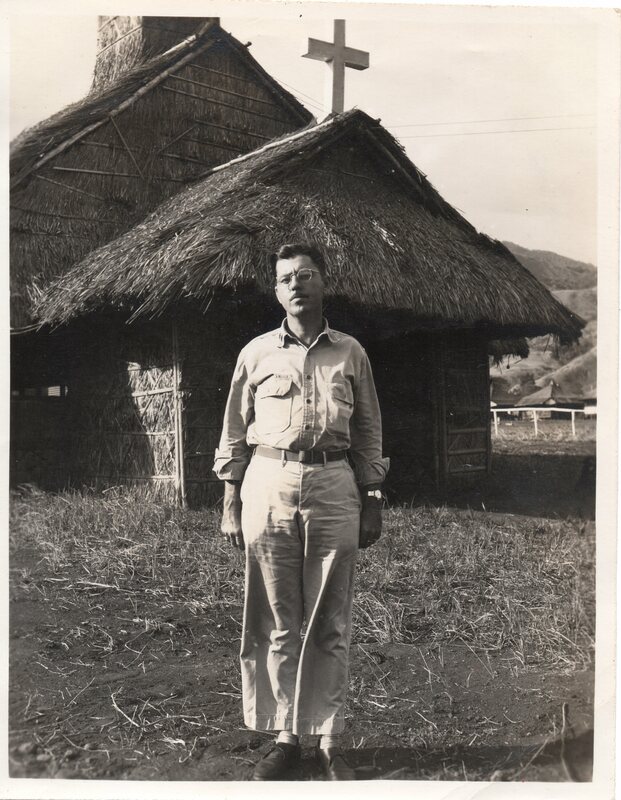 Un-named chaplain of the 8th Service Group in New Guinea in front of his office and possible quarters (author’s collection). US Army chaplain in field service with Marines on Iwo Jima beach. 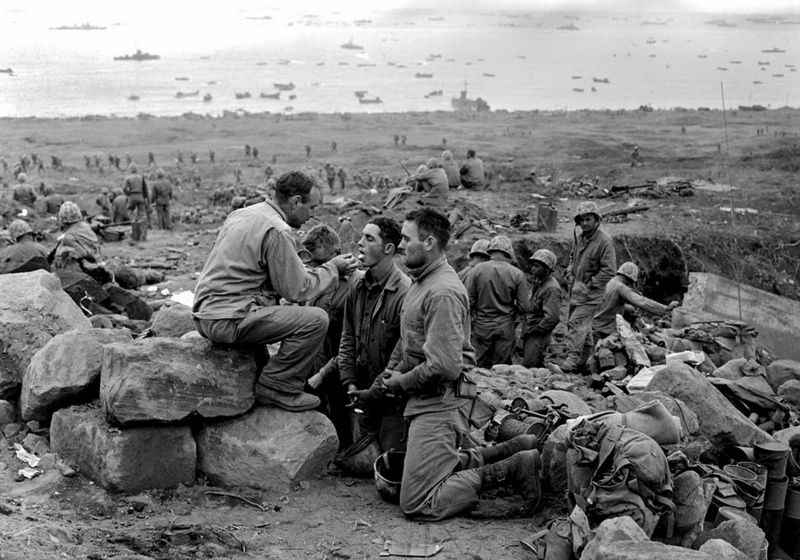 “Atop battered Mount Surabachi, a Marine received communion from a chaplain” Photo by L.R. Burmeister (author’s collection). “SEA BURIAL OFF IWO JIMA. 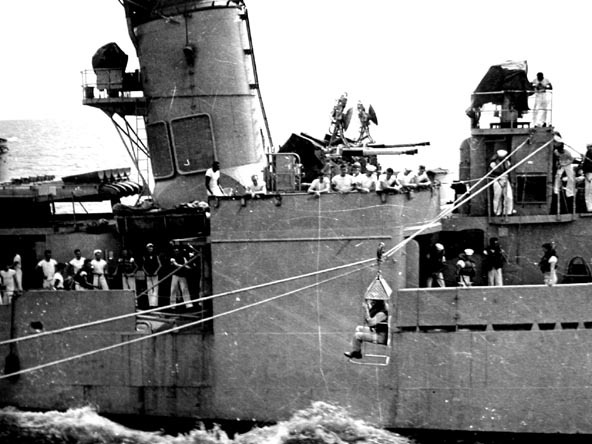 From the deck of a Coast Guard-manned invasion transport, two Navy men who died of wounds suffered in the battle for Iwo Jima are committed to the deep. The ship’s chaplain reads the burial rites over the bodies of the deceased as their comrades stand silently, some with bowed heads. Then, the bodies are slipped over the side from beneath the flag for which these heroes gave their lives. 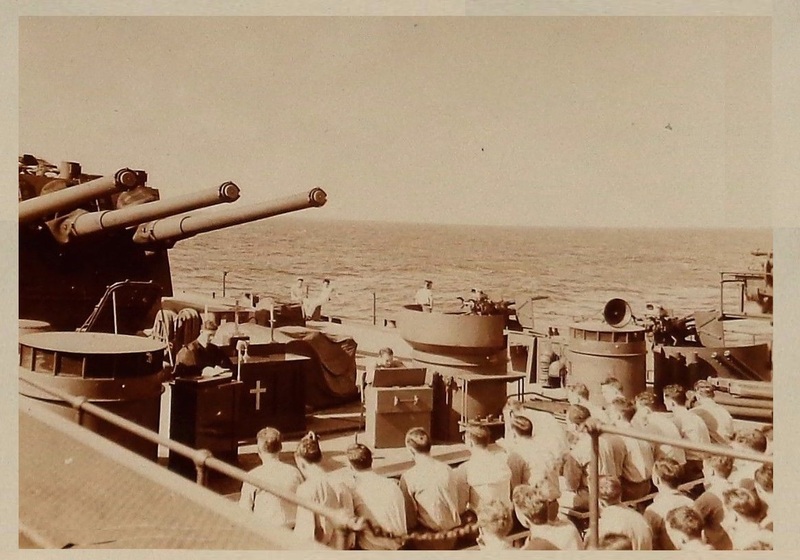 27 March 1945.” Official Coast Guard Photo. 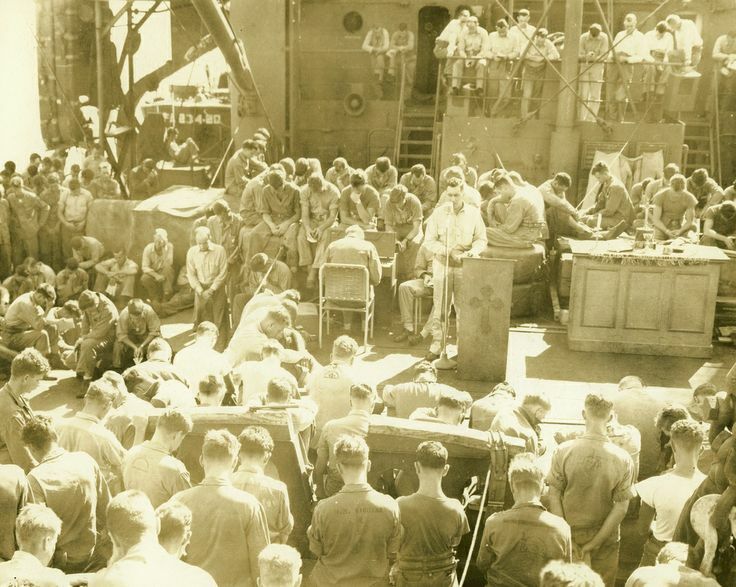 “The crew of the USS SOUTH DAKOTA stands with bowed heads, while Chaplain N. D. Lindner reads the benediction held in honor of fellow shipmates killed in the air action off Guam on June 19, 1944.” July 1, 1944. 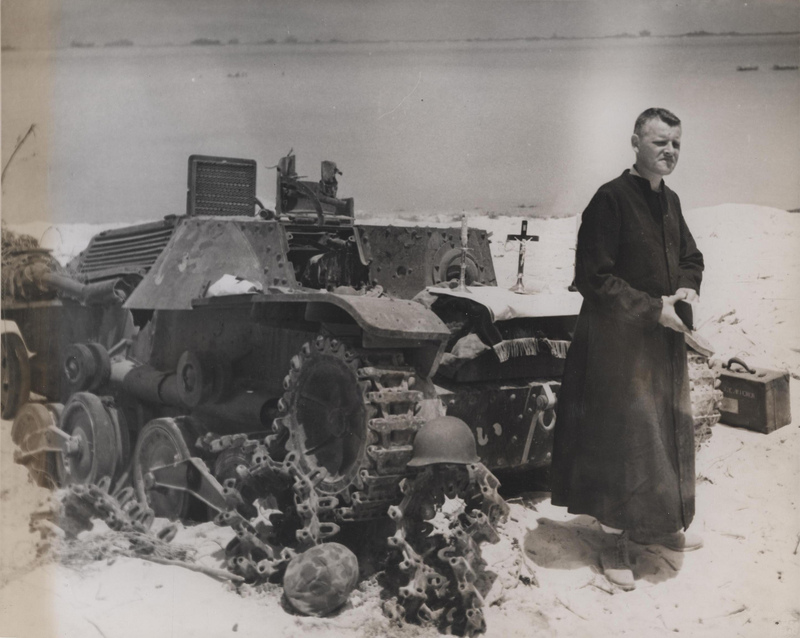 “Protestant Chaplain Rufus W. Oakley holding services within a few hundred yards of Japanese positions, well within range of their mortars if they had chosen to throw them at Peleliu” 1944. “First Burial in New Memorial Cemetery. Honolulu, T.H. : Chaplains of three different faiths say services over the casket of an unknown member of the armed forces killed during the Japanese attack on Pearl Harbor, who was buried along with 108 war dead in the new National Memorial Cemetery of the Pacific at Punchbowl, Honolulu. Officiating at the service are (L-R) Capt. Albert F. Click, Protestant; Rabbi Emmanuel Kumin, Jewish; and Capt. Eugene L.A. Fisher, Catholic. 1/7/49. 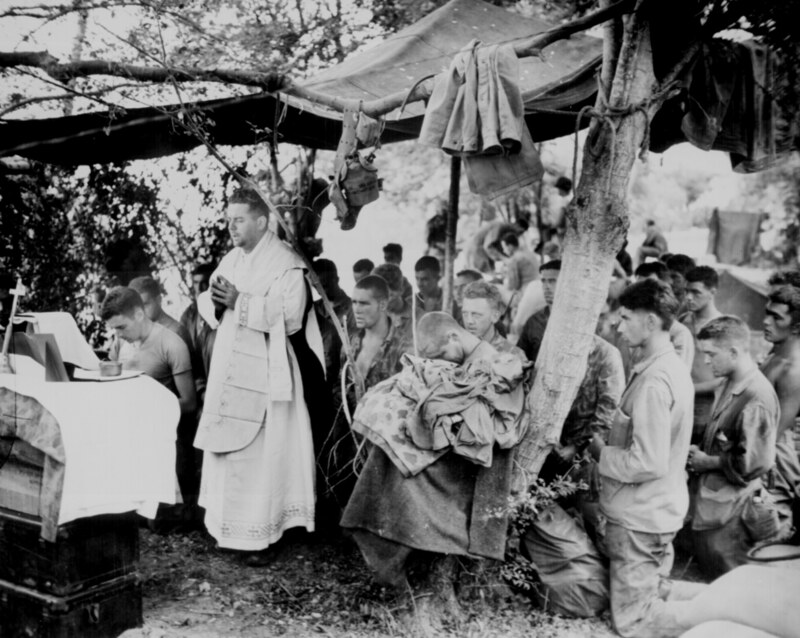 “CHAPLAIN CELEBRATES MASS. 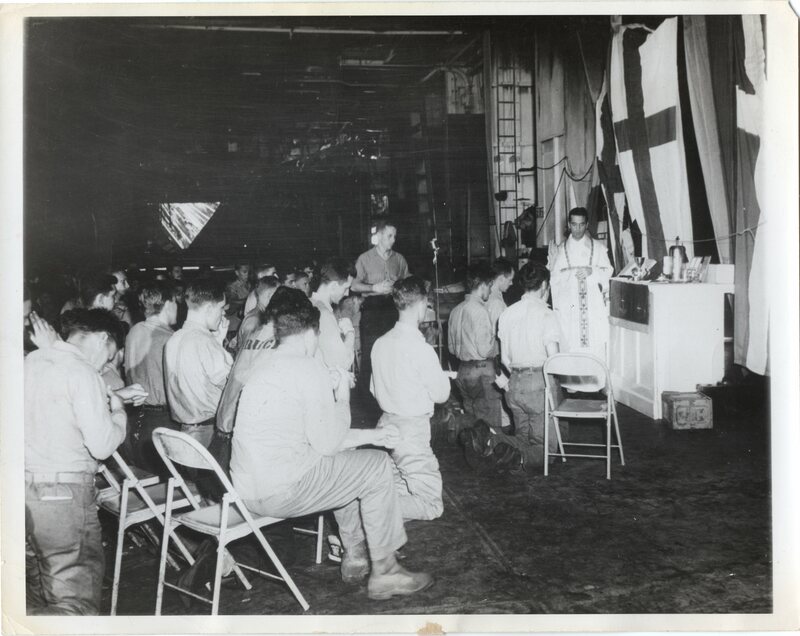 Following the battle with flames and explosion aboard the USS Bunker Hill, which was hit twice by Jap suicide pilots off Okinawa, May 11, The Catholic chaplain celebrates mass in memory of the 392 crewmen who gave their lives in the attack. 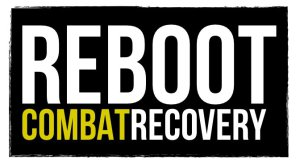 The survivors attended the memorial services on the flight deck” (author’s collection). 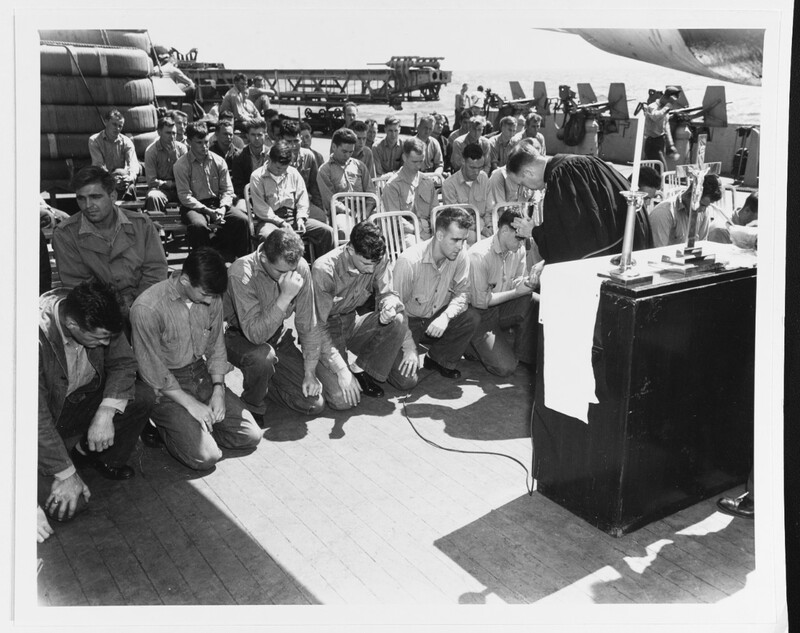 Worship service aboard the U.S.S. Indiana. 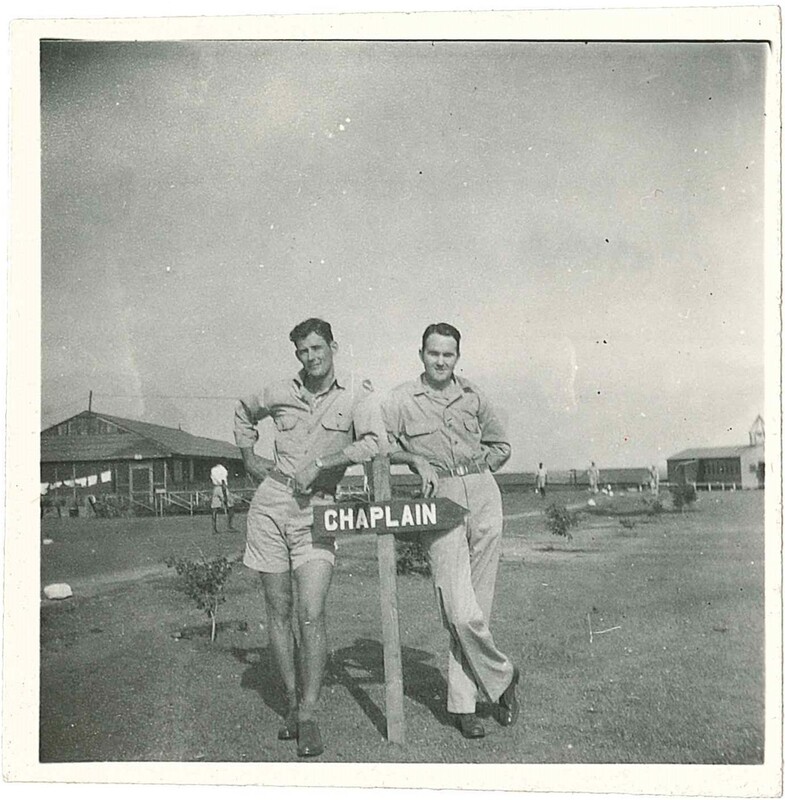 Not a chaplain or chaplain assistant, but two USAAC Soldiers posing by the sign pointing the way to the chaplain’s office (with the chapel on the far right of the picture), (Author’s collection). 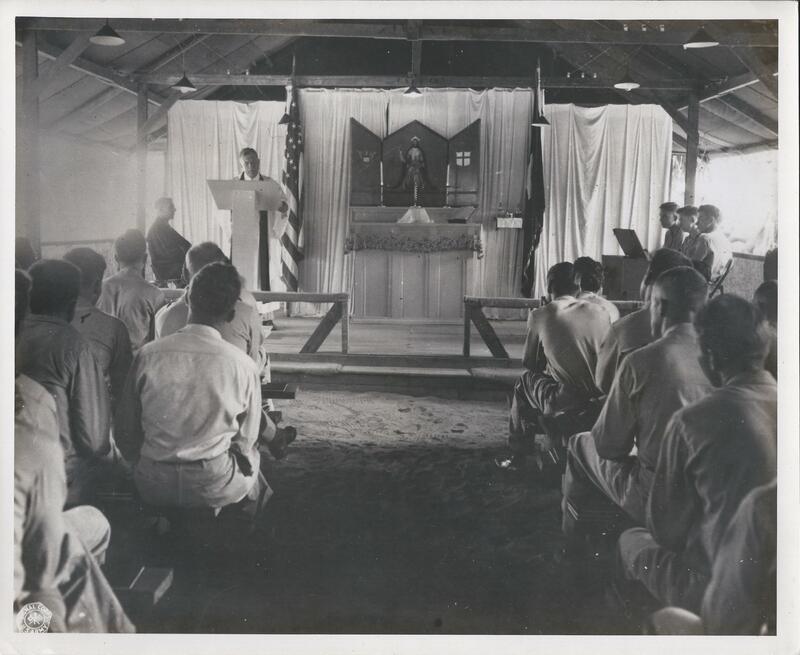 At the pulpit: Chaplain Luther D. Miller, seated left: Chaplain Poch, in an open-air chapel, likely in the Far East. Date unknown, perhaps 1944 (author’s collection).